1. Demonstrate my ability to apply to use appropriate methodologies for planning and creating a display that informs the public about intellectual freedom. The display will be created and displayed during Banned Books Week. 2. Demonstrate my ability to create and conduct in-person surveys. These surveys will identify and analyze the information needs of the library's active user community. 3. Demonstrate my ability to develop, deliver and evaluate computer technology training programs for the public. These programs will take into account previously conducted needs assessments, available library resources, and customer needs. The individual steps taken to complete these objectives have been documented within this blog under the Internship label. I have greatly enjoyed getting my blog up and running. My internship at Evergreen Branch was a great excuse for launching myself into the blogosphere. I look forward to developing new projects and topics to discuss with you. 1) Please rate the overall quality of the class. 2) The presenter was knowledgeable about the subject matter. 3) The presenter was able to communicate the subject matter effectively. 4) I will be able to use what I learned in this class. 5) How did you hear about this class? 6) Do you feel this class INCREASED your awareness about digital photos? 7) What would you suggest to improve the class? 8) Do you have any suggestions for future classes? 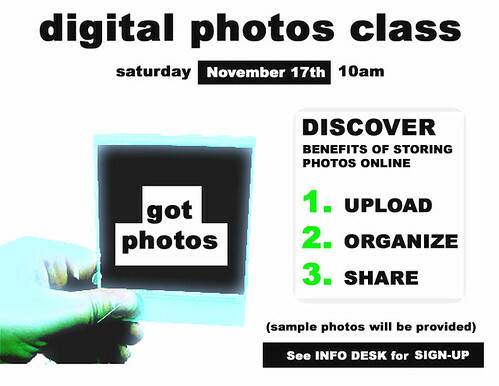 On Saturday, Nov. 17th, I led a class covering the benefits of sharing digital photos online. Much preparation was invested in curriculum development. Five members of the public and two staff members participated in the class. A few technical difficulties were encountered between my laptop, the Internet connection and the projector. I learned that testing all the technology components before the class is absolutely necessary. Also, using the same machine and the same Internet browser as class participants might contribute to smoother timing and delivery. Took a few hours today and explored the top online photo hosting sites: Flickr, Photobucket, Image Shack, Shutterfly... The goal was to evaluate the features and usablity of each in order to determine which would be the best one to introduce during the library training. Each had it's advantages and disadvantages, but Flickr seems to have the most to offer, so that will be the one! 1. Determine which training must take place? Surveys indicated that #1 topic of interest is photo hosting and tools. Our first training sessions will focus on Flickr. 2. Identify tasks to train and evaluate? • Interested in learning: How to store and use your digital photos online! 4. Identify outcomes to be measured? • Does customer feel they have an increased awareness of online photo storing and photo tools? • Was the training useful to their life? Time preference were NOT included for all surveys that indicated NO on the possibility of attendance. 1. How often do you use the Internet? 2. What Internet applications would you like to know more about? Blogosphere? Why the hype? Know how to begin? Where are they? Know how to access them? Free photo storage? Know how to transform your images? What are feeds? Know how to get personalized News from one place? Streaming audio and video? Do you have personalized radio and online TV? Bookmarking the Internet? Know how to maximize your online resources? 3. Would you actually attend a one-hour seminar to learn more about these topics? 4. What days would be best for you? 5. What times would be best for you? "To increase customer awareness of today's useful Web2.0 applications."